Having ample lighting in a kitchen is a practical matter — being able to clearly see what you’re doing is a necessity in a space where you prepare, cook and eat food. Pendant lights above a kitchen island or table are an ideal way to cast a wide swath of light over a surface. While oversize pendant lights do not necessarily cast more light than standard-size pendants, they do provide a dramatic style statement in the heart of your home. 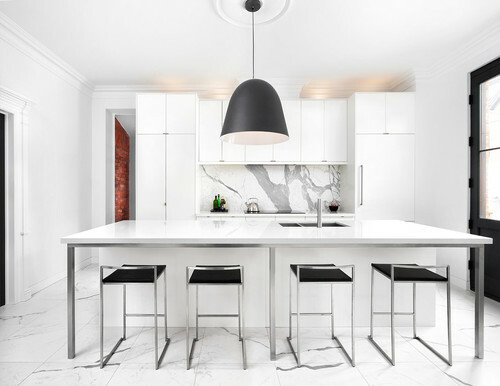 Here are 10 on-trend oversize pendants featured in a wide range of kitchen styles. 1. Transitional. With its minimalist white color palette, traditional coffered ceiling and rustic hand-carved wood pendants over the waterfall island, this transitional San Francisco kitchen designed by Jeff Schlarb highlights a great mix of styles. 2. Industrial. 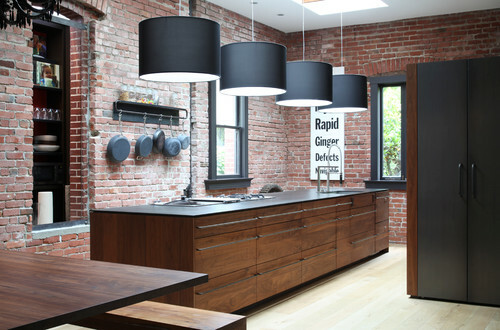 This industrial kitchen in Mill Valley, California, is located in a former library that retains its original brick walls. 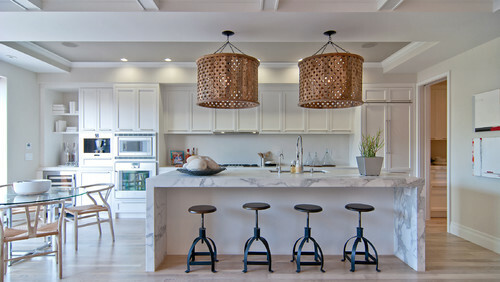 Four oversized black drum pendants hang above the black Richlite-topped island. 4. Farmhouse. 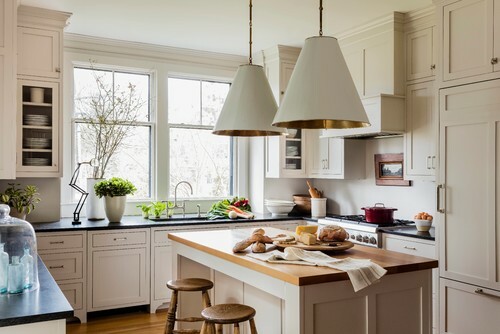 For this farmhouse kitchen in Massachusetts, designer Lisa Tharp commissioned Carol Collord, owner of Creations by Carol, to create these oversize pendants out of Belgian linen. 5. Traditional. This classically handsome kitchen in Boston features Shaker cabinets painted in Farrow & Ball’s Skimming Stone and a wood-topped island. But it’s the pair of Thomas O’Brien Goodman pendants that demand the most attention in this serene space. 6. Eclectic. 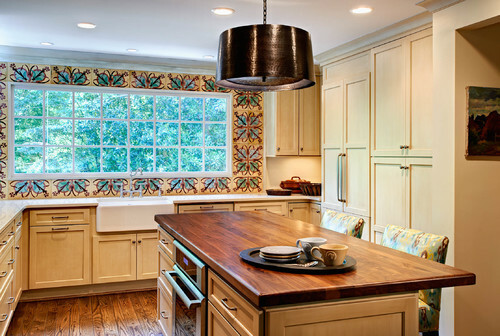 With its hand-painted tile walls, pale yellow cabinets and walnut-topped island, this Charlotte, North Carolina, kitchen is stylishly eclectic. The oversize black-painted steel drum pendant provides the finishing touch. 7. Coastal. A pair of distressed iron Fenchurch pendants from Currey & Co. add a rustic touch to this light and breezy coastal-inspired kitchen in St. Louis. 8. Asian-inspired. A Nelson pendant light adds a midcentury touch to this Asian-inspired San Francisco kitchen designed by John Lum Architecture. 9. Rustic. 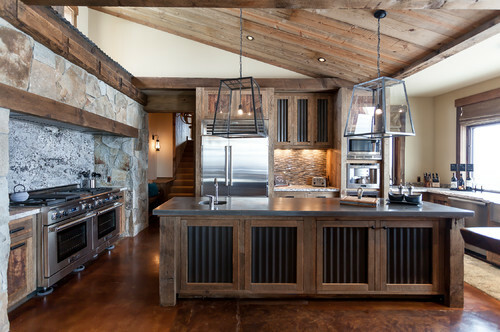 This rustic kitchen in California’s San Gabriel Mountains features a pair of blackened steel and glass lantern pendants over an island made out of reclaimed wood. 10. Updated Arts and Crafts. 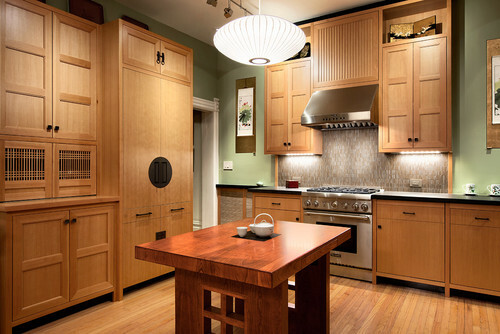 This lovely remodeled kitchen in San Francisco features a new take on Arts and Crafts style. The chunky lines of the wood stools and three oversize pendants have a distinctly Usonian vibe. Related: What Else Makes Up Craftsman Style Homes?